Brander F/Red Santa Ynez Valley, California - This juicy blend of Cabernet Sauvignon, Merlot,and Syrah is deliciously approachable and rewarding. The dark ruby robe, nearly opaque, seques into a nose of brambly red fruit, pine bark, herbs de Provence, and homemade raspberry jam. La Playa Cabernet Sauvignon Rose 2015, Chile - Delicate pink color. On the nose, floral notes with hints of raspberry and plum. 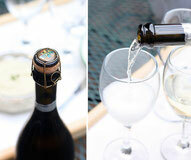 It is a dry wine with good acidity and refreshing strawberry palate. Copper Ridge Cabernet Sauvingnon, California - Medium bodied with flavors of blackberry, plum and cherry fruit; a hint of spice. Copper Ridge Chardonnay, California - showcases ripe tree fruit with notes of pineapple and mango. The wine is enhanced with notes of toasted oak and brown spice. 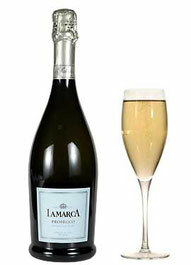 La Marca Prosecco, Italy - Named one of the "top 100 wineries of the year" by Wine Spectator. Bubbles are full textured and persistent. This wine is fresh and clean with the ripe citrus, lemon, green apple, and touches of grape fruit, minerality and some toast. Leese-Fitch Cabernet Sauvignon and Chardonnay, California - Full-bodied, this wine present aromas of fresh roasted hazelnuts, espresso, and cherry liquor. In the mouth, this Cabernet exudes deep blackberry notes with toffee, dark cherry, dutch cocoa, and tea leaf. Old Soul Pinot Noir, California - Expresses big fruit and ample richness for the varietal. The blackberry notes, from the blended Zinfandel, gives this wine its distinct Lodi character. The palate is soft and round, with good weight, yet still maintains the gentle acidity in the mid-palate that is distinctively Pinot. Mirassou Pinot Grigio, California - Exudes white peach, baked apples, and juicy pear with hint of citrus fruit. The sweetness of the bright fruit flavors balances nicely with crisp acidity. Versatile wine pairs nicely with a cranberry scone all the way to grilled poultry and spicy dishes. Shannon Ridge High Elevation Sauvignon Blanc, Lake County, CA - Crisp and refreshing with aromas of citrus and topical fruits, the wine has flavors of guava, citrus and lemongrass. William Hill Estate Winery Merlot, California - is reminiscent of a bold Cabernet Sauveignon, with its rich flavors and substantial mouthfeel. Aromas of blackberry, black cherry and toasty oak set the stage for a palate of decadent black cherry, pepper and chocolate.